QUESTIONING BY THE APEX JUDICIARY THROWS LIGHT! A gender biased religious dictum which has been observed for quite a long time under the garb of custom and tradition in Sabarimala, a popular temple in Kerala, has been questioned by the Supreme Court of India. The peculiar custom that prevails among the devotees is that women between the 10 to 50 years of age – group are not allowed to enter the temple. The premise of this peculiar custom is thus : The worshipped deity viz. Ayyappa is believed to be a bachelor for ever. If the women who are in the physiological process of menstruation enter the temple, it will pollute the temple and spoil the celibacy of the deity. The Travancore Devaswom Board, which administers the Ayyappa temple has been strictly enforcing this rule ever since the temple became prominent. There was hardly any serious awareness of this gender biased discrimination. But even among the sincere devotees, there were a few in Kerala began to question this practice. A Public Interest Litigation was also filed against the Devaswom Board. The then left Democratic Front Government in 2008 upheld the PIL and said that the discriminatory practice should be discontinued. But, the Devaswom Board continues to practice the gender bias after a stay order in 1991 for the directive of the Government. 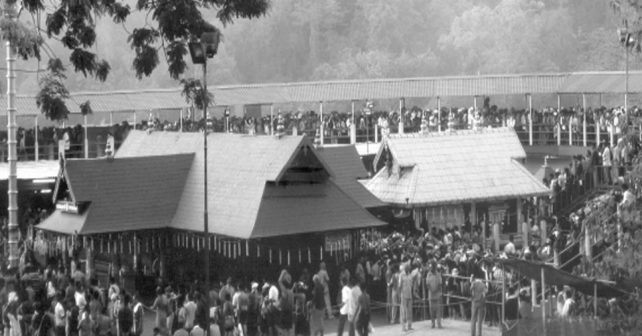 The contention of the Devaswom Board is that the discrimination in entry into temple is neither a ritual nor a ceremony but a religious principle. It is sacrilege to allow women. Meanwhile Indian Young Lawyers’ Association and five women lawyers filed a petition in the Supreme Court seeking a direction to allow entry of women into the Ayyappa temple. Naturally the Devaswom Board contested it. A three judge Special Bench heard the petition. The counsel for the Devaswom Board argued that it was a “religious practice” in which, neither the courts nor the government could interfere. The deity was believed to be in celibacy and in the posture of meditation. Women in the menstrual period were not allowed to enter the temple as that could disturb the deity. This worn-out argument did not make any difference in the opinion of the Supreme Court. Even though the Court adjourned the matter for a detailed hearing, it has raised a basic question. “Why not women should go to Ayyappa temple?….. Temple is a public place. Our Constitution gives the right to worship to everyone equally. It would be a violation of Constitutional rights if women are denied entry into Sabarimala. The deity known as Sashtha is not anti-women deity”, they observed. “Constitutional legitimacy, naturally, supersedes all religious beliefs and practices”, the Supreme Court pronounced in an earlier case on another ground related to the issue. Obviously there is no basis for prohibiting women from entering into the temple as well as to its sanctum sanctorum. Such an observation of the Supreme Court is a remarkable milestone in establishing the tenets of human rights. Also the rights of women banning their entry will be in violation of Article 14, and even 25 and 26 of the Constitution. Such meaningless regulations were the manipulations of purohits and Archakas. In case of any woman, violating it, these vested interests will make money by telling that it is a great sacrilege and the temple must be cleansed of the sin. It may be recalled that in 1987, a Kannada actress Jaimala disclosed that she had entered the sanctorum and touched the idol. A great hue and cry was made by the purohits and they conducted a special ritual to purify the idol. To these murky practices, at present an end has come from the corridors of the Supreme Court. An overhauling of the meaningless rituals and doing away with the ceremonial practices has become the order of the day. A matter relevant to this issue needs a mention in this context. There had been a lady working as Executive Officer in the Srirangam temple of Lord Ranganatha in Tamil Nadu. When she entered into the sanctum sanctorum, a local purohit prevented her from stepping in. When she furiously threatened him that she would order him to be arrested, he became dumb-founded. When the barbarian and inhuman devadasi system – a “religious practice” and a religious enslavement of women leading to the birth of children becoming fatherless, was about to be declared illegal, it was protested by the sanatanics as anti-religious and interference of State in the religious affairs. They proclaimed that they were ready to defy the legislation and court arrest rather than for abolishing the devadasi system to uphold the sanatic (a) dharma. The State brought the legislation stubbornly against the claim under the defence of meaningless customs and traditions. One more incident from Maharashtra State also indicates a welcome change in the in the administration of Hindu temples recently. One Anita Shetty, a 40 year old house wife has been appointed as the first woman Chairperson of Shani Shingnapur Temple Trust in Ahmed Nagar District. In the five-century old history of the temple, she is the first to become the Chief of the Temple Trust Board on a five-year term. The other eleven Trustees also include another woman, Vaishali. Mrs.Shetty’s appointment comes in the backdrop of four women from Pune stormed the temple premises to break the age-old tradition that prevents women from offering worship to the deity Shani from close quarters. It is expected that the new administrative environment in the temple will be liberal in permitting the woman devotees to step into the sanctum interior. These incidents reveal that the day is not far off to see that women are marching ahead with men in all aspects of life, including the religious aspects as a matter of equal right. They are no longer to be neglected and set aside. They have become a force to be reckoned with in the civilized society. Gender bias will soon become a thing of the past.